Thursday 11 a.m. - 1.30 a.m.
Buy next door, smoke in (beer) bar; excellent, rammed on a weeknight; well worth visiting The Hague to come here. Mississippi_Bullfrog from Belgium. Sent 21 Nov 2010. The Doctor from UK. Sent 3 Dec 2009. This place divides local opinion. Comfortable traditional Dutch bar decor, licensed for alcohol, quality coffee, live DJs, it feels like the best Amsterdam coffeeshops of yesteryear. 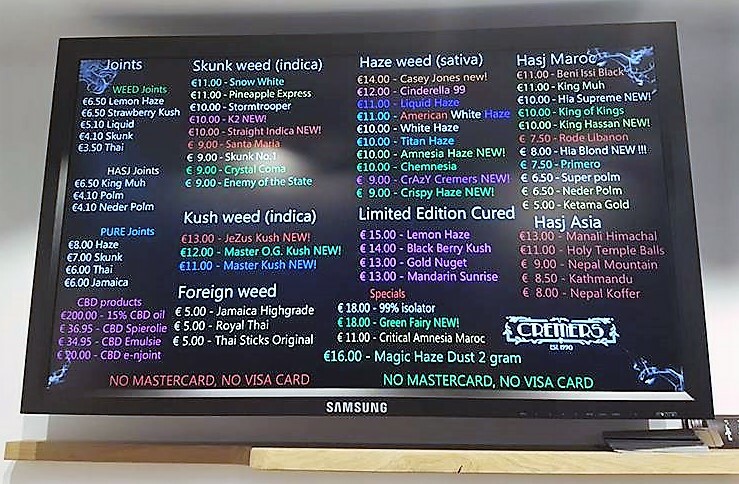 There is a good, varied weed/hash menu but it's very expensive for Den Haag and always busy, irritating some locals who view it as a tourist ripoff. It may be, but it's a great all evening coffeeshop and this is increasingly rare. Adub from USA. Sent 13 Nov 2009. The first coffeeshop I have enjoyed since being here. Kinda busy, but one of the few shops where you can still smoke (bud), drink, and they even have a cigarette booth. 6 euro for 1 gram Jamaican, didn’t look very good but smoked fine, probably wouldn’t buy it again though) and very cool budtenders and waitress. Best hot chocolate ever, and all around nice spot to chill, I would definitely recommend to anyone in The Hague. Pé Gordo from Brazil. Sent 17 Mar 2009. I liked this place, different from everything I have seen in Holland. Just on the corner is the coffee shop with very good menu of weed and hash from top quality haze to average hash. Prices between 25 euros per gram (Ice-hash) to 6 euros per gram (Skunk#1) with very friendly budtender. Next to it is the bar/pub where you can drink alcohol and smoke weed and if you want to smoke tobacco there is a shed made of glass inside the bar/pub so you don't have to go out to smoke your tobacco. They have bongs, pipe, paper and etc. Koopa from USA. Visited April. Sent 28 Feb 2009. For first timers in Den Haag (10th time to the Netherlands though) this shop proved to be a touch difficult for us to locate. Fortunately, it was well worth our effort as it was the best shop we found in town! They have a small buy and fly counter on one side and a door leading to a full bar that is smoker friendly on the other side! The menu choices varied from 6,50e per gram (Grapefruit) all the way up to 12e per gram (Diesel) and they had lots of unique varieties that were a step up from most of Amsterdam's weed. I got this strain with some ridiculous name, something like Super Fluffy White Hairy Weed for 8e per gram and although it was a bit fresh it was a winner. What I liked even more than the good herb at fair prices, was the comfortable atmosphere of the bar area next to the buy and fly section. It was more like a diner with an expansive bar on one side (large comfortable booth seating on the opposite wall by the windows). Hertog Jan beers were on tap (not the greatest Dutch beer but a decent local option) and the freedom to smoke weed with or without tobacco while choosing to drink alcohol or not was refreshing. I wish Amsterdam would do away with all the silly restrictions that have been placed on its local coffeeshops. At Coffeeshop Cremers you get back to the authentic coffeeshop experience of previous years! Lucky Lucy from Netherlands. Sent 27 Dec 2008. The Cremery in Den Haag is tops! Highly, and I do mean highly recommend the Eco Ultra Haze. No chemicals, huge sticky crystals and hugely effective. Also Carmello hash is the bee's knees. I'll be back soon! Like tomorrow because I'm almost out. Nattaman from Italy. Sent 9 Oct 2007. The best cafe of the city. They serve beer "Jan Hertog" very good beer. They have a great Amnesia Haze and the black hash is very good. Really impressive. This was definitely the best place we visited in The Hague. The Kali Mist, Siberian Tiger, Sensi Smile, White Widow, Skunk, and the King MUH (Hash) were all excellent. The K2 and the Purple Haze were disappointing. Tom from USA. Sent 16 Dec 2005. I wasn't quite up for a drink so I didn't check out the bar, but the coffee shop had an excellent menu featuring a wide variety of hashes and weed from all over the world. It has the best selection of hashes I have seen in The Hague. I purchased some Purple Haze and then purchased some Tazmanian at the shop keepers suggestion after I asked for K2 which had ran out. I doubt it came from Tazmania, but it was quite a good high. The Purple Haze had the typical spicy taste of purple strains and typical sativa high. Great selection, but the best hash was too expensive for my taste at over 40 euro a gram. Jos from The Hague. Sent 30 Mar 2005. Very smart and friendly crew! My first time in a coffeeshop was in Cremers, the crew taught me lots of things and was very patient and friendly. The other people who buy their stuff here are very friendly 2! I have been to other shops, but I always come back to Cremers. Anon. from Netherlands. Sent 3 Feb 2005. Sportkip from Netherlands. Sent 18 Nov 2004. Had never been to a coffeeshop before and did not know what to use and buy. Wanted something for medicinal use (pain relief). The guy in the shop was very friendly and gave me good advice and since then I have been back twice. BAC from Netherlands. Sent 11 Aug 2004. Cremers is with no doubt the best coffee shop in the Hague. Cremers has a small part where you can buy your weed or hash and then has a very nice bar. It has the finest weed (they are all good but my personal favourite is California Red Bud), the bar is also very nice and has a nice welcoming atmosphere. The staff is nice and occasionally they have "happy hours". The prices are alright, not the cheapest but not outrageous either, California Red Bud costs around 6.75 euros a gram, although if you don't want to spend much you can always get a bag of Magic Dust (already crushed) for 12 euros for 3 grams. They also have good hash, for example H2o which is very expensive but one of the strongest hashes around. Enjoy this coffeeshop, I certainly do.